Preheat oven to 325°F. Season the brisket by patting and rubbing Montreal Steak Seasoning on both sides of the brisket. Sprinkle both sides with garlic powder and pepper. Drizzle olive oil into a Dutch oven, roasting pan, or large, oven-safe skillet. On high heat, brown the brisket on both sides (about 2 minutes per side). Remove the brisket. Reduce heat to medium-high and cook onions with drippings until just softened (about 2-3 minutes), stirring occasionally. Whisk together coffee and ketchup. Remove the onions, or move them to one side of the pan. Return the brisket to the Dutch oven, fat side up, and arrange the onions over the brisket. Add carrots and mini potatoes. Pour the coffee and ketchup mixture over the brisket. Cook for 2 ½ hours, or until tender, basting occasionally. 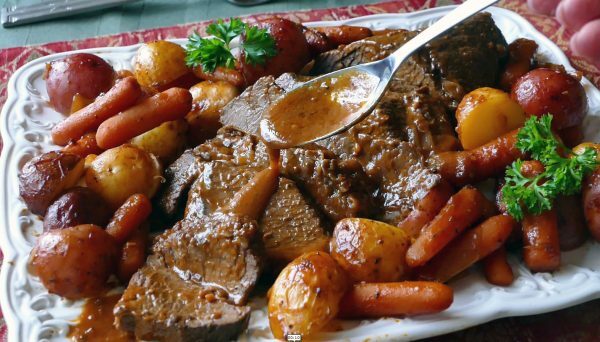 Slice the brisket and smother it with the onions, carrots, potatoes, and gravy.